We have ourselves a beach baby! Which is kind of funny really, being that neither Jonathan nor myself are overwhelmingly fond of the beach. (I like it more than Jonathan.) We took the kids to our "local" beach about a month or so ago and Bookworm3 nearly passed out with glee. Despite the fact that the water was frigid, she was happy as a clam running further and further out into the waves. She loved tasting sand, sinking into it and generally making merry with her brothers. It was a blast watching her! Since then, I've been keeping my eyes and ears open for beach titles and there are two which I was provided for review which I will present to you now. This is a tactile learning book. If your kidlets like touching different surfaces, than this is a fun book to flip through. It's a board book, so it is nice and sturdy. Each page spread has one sentence on it, so it is best utilized by the earliest readers among us. Each page also has something different to feel. There is a shiny sail on a sailboat which you can flip over, a rough sandcastle and, most impressively, a sticky peach! (That page is quite popular with my 1, 3 and 5 year old.) Simple illustrations of a cute panda bear exploring the beach makes this for an enjoyable read. 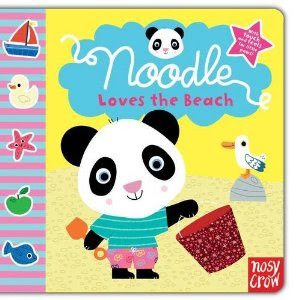 (I'm very curious to find out what the other Noodle books are like now!) Bookworm3 (age 15 mo.) loves it! Secondly, we enjoyed Maisy at the Beach: A Sticker Book . 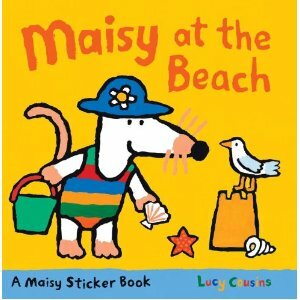 In Maisy at the Beach the readers are encouraged to complete the story being told throughout the book by applying appropriate stickers on each page. For example, one of the pages talks about how Maisy and her friends are at the beach. Then it asks if you would please put the beach hats on Maisy & Co. We took turns adding stickers to complete the story and then read the book through together at the end. This one was popular for activity sake but I can't imagine that we'll be re-reading it over and over again (as we do with other Maisy titles) because the text prompts action which, once taken, isn't as exciting. Both books were provided to us by Candlewick Press in exchange for our honest thoughts which I have now given you. But I will leave you with a picture of my Beach Baby who had a fantastic time exploring the Oregon coast! Happy beach-like thoughts to you on this lovely Tuesday morning! 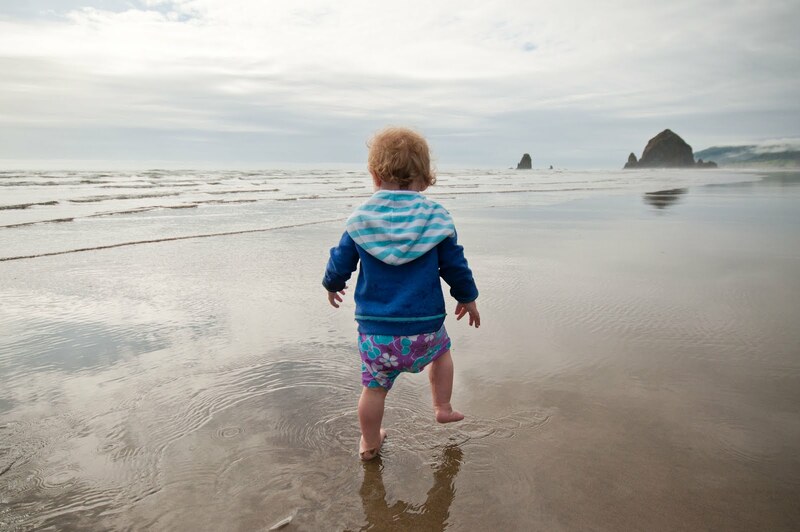 It is nice to know someone enjoys the Oregon beach. My thoughts about the Oregon beach are very dark and my family prefers not to get me going on the topic.